Many of us have a love hate relationship with concrete when it comes to our home renovation or landscape ideas. A great solid material we can form to our liking, yet leaves a significant legacy should we need to remove it in the future. From driveways and paths to retaining walls and patios, concrete is all around us. Cutting a concrete slab needs to be done right the first time, for your safety and for the quality of the finish. A sledgehammer and chisel is a mediocre solution to cutting concrete. Sure, it may remove small rough sections of concrete. But to cut through an entire slab, it has its limitations. Cutting a straight line is impossible and cracks are likely to appear where you don’t want them. Also, if you come up against any reinforcing mesh, this will add a significant interruption to your cutting plans. The next level up are relatively inexpensive corundum blades ($10 each) that will fit to a regular circular saw. Corundum blades wear down quickly, usually after a metre, so you will need a few of them for larger jobs. Also they will only cut to a very shallow depth. They also run red hot and create a lot of harmful dust plus they smell particularly awful. For cutting through a sizeable concrete slab, they have their limitations also. Diamond blades are designed to cut through very hard material like concrete. In fact, they don’t actually cut, they grind through concrete. The super hard and rough diamond coating on the tip of the saw scrape away concrete at the cutting surface. As they grind through concrete, the small diamond crystals become smooth and eventually peel off, revealing new fresh and rough diamonds that allow cutting to continue. Dry cutting concrete with a diamond tipped blade has two downsides. Firstly, they get very hot, so only short, shallow cuts can be made at any one time. Secondly, they create a large amount of very fine and harmful concrete dust. This dust can get in the lungs and cause silicosis plus it will carry a long distance covering everything in a thin film of fine dust. If cutting indoors this dust is particularly problematic so the whole work area should be sealed off with plastic and duct tape. To avoid excessive heat and prevent concrete dust getting into the air, wet-cutting concrete blades are worthwhile and recommended. Wet-cutting however brings its own complications. 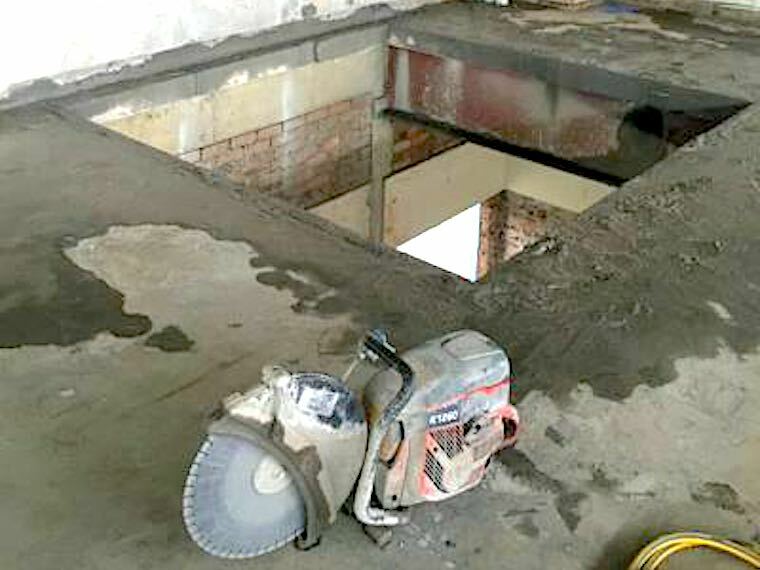 Electrical tools and water don’t mix so a specially designed concrete cutting saw is required. 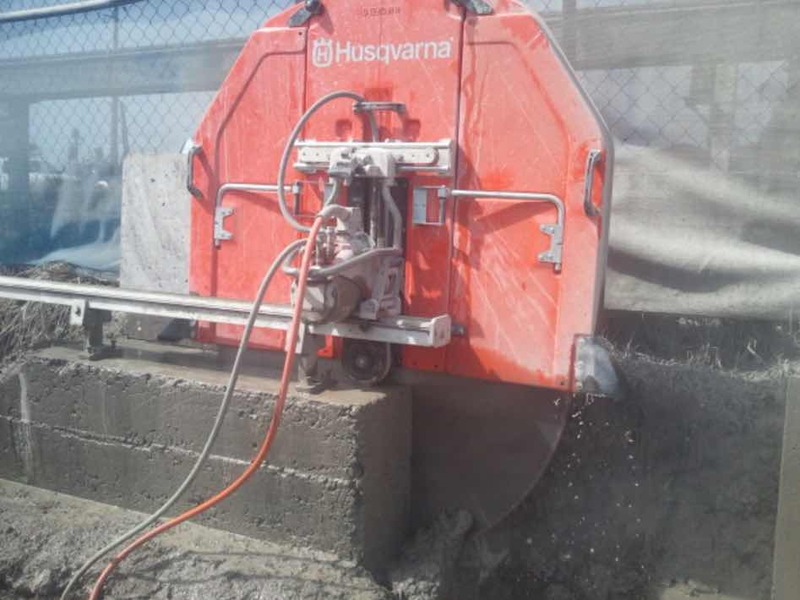 This concrete saw feeds water directly to the cutting surface and keeps electrical components sealed to prevent contact with the water. When facing a sizeable concrete slab it may be safer, cheaper and actually quicker to get professional help from a concrete cutter. 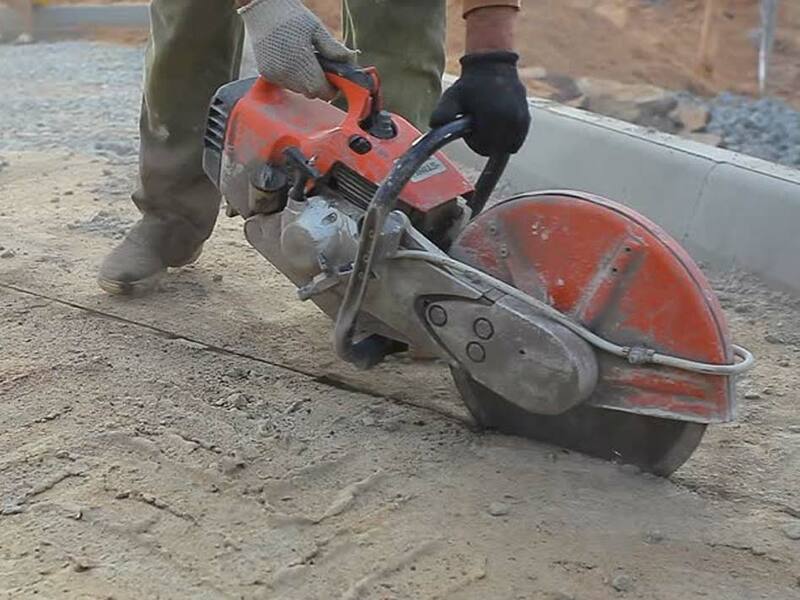 Concrete cutters have all the tools and techniques to cut, drill and grind through concrete. They have all the safety equipment to ensure concrete dust does not go where it shouldn’t and can ensure a quality finish. There is not much room for error with concrete cutting, so experience counts to do the job right first time around.